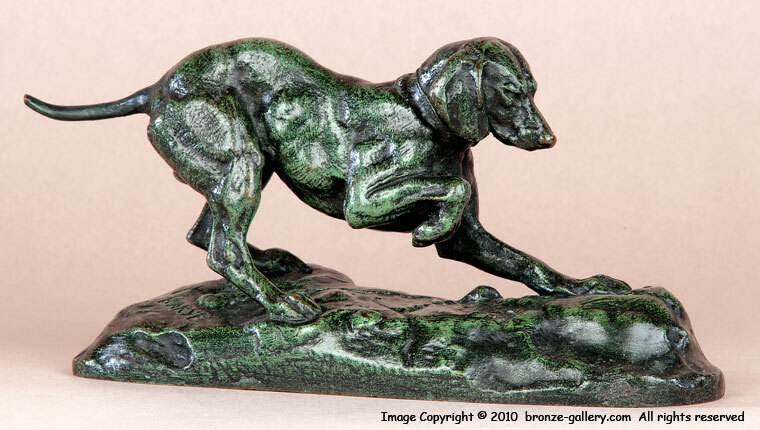 Along with his famous bronzes of Lions and Tigers, Barye created some fine models of hunting dogs. 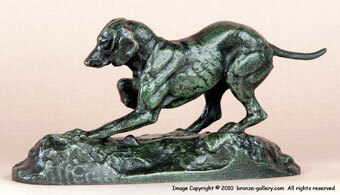 He first sculpted this Braque or Pointer dog and his companion piece the Epagneul or Spaniel in the 1840s. 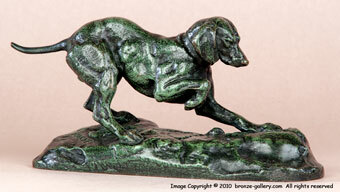 This Pointer is the First Version and it is the pendent to the Barye Spaniel. The base is a simple textured ground and the dog is captured on point with his foreleg raised and all his muscles tense. The model was first created in the 1840s and our bronze was cast some years later in the 1850s. It has good detail and a rich dark green and black patina. A cast of this model is illustrated in Payne's book Animals in Bronze on page 224.